That's why this group was started! For all of us to connect and know we aren't alone. Hi Murees - it sounds like you have the right attitude to writing - enjoying the process and we're lucky that we can connect with so many great blogging friends who help so much along the way. There's always a certain amount of insecurity connected with writing. It makes you work harder to combat the issues - everyone can make improvements to their work! Keep writing and it will all be good. No worries. Deanie - Thank you. Your words are really kind. Alex - Thank you for all you do. It is appreciated. Kimberly - Thanks for the hugs! I am happy I joined the group too. I have met so many wonderful people. Hilary - Thank you. I don't know what I would do without the blogging community. The people are really wonderful. Annalisa - Thank you for the wise and inspiring words. 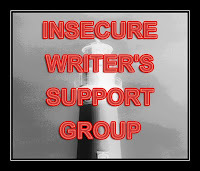 I guess the insecurity just comes with the writing, like a side effect. I like that you said that anyone can make improvements to their work. It makes me feel hopeful. Ryshia - Thank you. You are really kind. Timing is everything, isn't it? You wrote this blog post. Today this appeared on another publishing blog. "We Have to Believe." For me, the insecurity never really goes away. We need to learn how to manage it. I think it takes time and patience. I'm trying. Keep on writing. That's the main thing. Just remember, writing (like life) is not a race. Enjoy the journey. John - Thank you for the link. The post was great and inspiring. Michelle - Thank you. I agree, it is always bubbling. I need to find the off switch. LD - Thank you. That is great advice, because sometimes I do feel like making writing progress is a race, but I have to slow down and enjoy things more. Jeremy - Thank you. I am definitely working at my writing. I am trying to learn more and more. Thank you for stopping by. Katie - Thank you. You are always so great and kind.